Family News - Our Precious Squeek, aka Kitty Girl, is now at our Heavenly Cottage with our other kitties and my parents who watch over them until we get there. Squeek as a feral was an FIV kitty (like human HIV) and during past 3 years has been challenged with the symptoms of Feline Chronic Renal Failure after a surgery to have her teeth removed (due to a problem that occurs with the gums because of the FIV). She went deaf after that procedure also. . I think the nerves to the ears are close to the dental area since Googling showed me this was a common result. I had used an herbal extract called CBG that had brought partial hearing back but it's not a quick fix and after a few weeks she simply wouldn't tolerate those drops in her ears and would hide from me. Had a lot of clothes well stained also from her shaking her head and spraying it all over me, so I stopped. She didn't seem to be bothered with the deafness as much as the ear drops. She's been a real trooper when it comes to getting enough water in, so I was so thankful we didn't need to do the fluids thing. She was always a good water drinker which many cats are not. She enjoyed lying in the sun at the breakfast window in Winter. We were waiting for the time Spring would allow us to live on the porch all day, but it's just now getting here, but she now has great weather all year long ... even though there aren't any years or counting of time in Heaven. Squeek was 19 years and 8 months old. Quite a feat for an FIV cat with renal failure. She was our favorite kitty of all time because she had such a gentle loving spirit and seemed to learn instantly the things we did not allow, like lying on furniture. She loved playing with strings or anything that was swinging in front of her, but would have nothing to do with toy mice or balls. 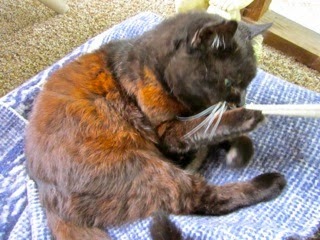 We've had beautiful and amazing cats over the years ... all coming to us as strays with Squeek being the first feral cat. A month ago I received a gift coupon for a free photo book at Shutterfly and decided to do it on all the cats we've had. Boy, that's a dedicated project doing those photo books. I can't tell you how many hours it took me to get it done, but I did finish is late last week and wanted to share the link with you, if you're interested in seeing it. I'm glad I got it done before the decision to release her from this earth on Monday. I haven't even received the photo book yet. View my "What Is a Cat?" Photobook at Shutterfly. You do not need to log-in or join to view it. Critters - Randal cleaned out the pond a couple of weeks ago. 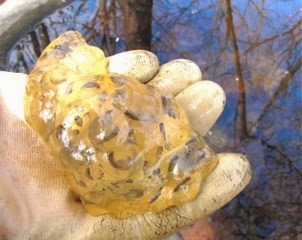 We schedule it so that it's before the frogs and toads lay their egg masses in it. It's always a fun event to find the bugs and critters that are living in it as he pulls them out of the pile with each scoop of the net. We have loads of Red-spotted Newts. I think they are so cute! I love playing with them for a bit. All slippery and active. Newts are actually a type of salamander, so all newts are salamanders, but not all salamanders are newts. This particular species of newt is very widely distributed in North America where there are two types and only one of them is found east of the Mississippi River ... and that's obviously the one we have. The newts lay their eggs in the pond and females can lay up to 400 eggs which will hatch between 3-5 weeks later. She doesn't stay with the eggs, so they are in a toxic gel-like substance that keeps predators at bay. The life cycle has 3 stages after hatching. 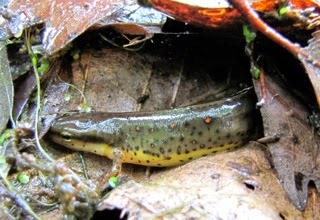 The eggs turn into aquatic larva with gills, remaining in the pond until they are juveniles and they are then terrestrial and also called efts for a period up to seven years when they are considered adults. They then go back to the pond to breed. Since they have no gills, they now breath at the pond's surface through their lungs. They do stay near the pond to keep their skin moist. Newts eat insects, slugs, snails, and earthworms. We've asked that they leave the earthworms alone. They live to be 15-20 years old. We were blessed to find an eft under a stump one time when we were looking around the yard. 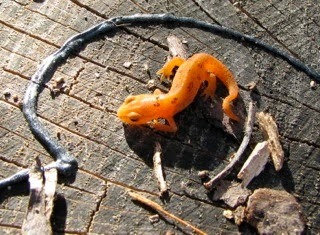 As an eft they are slightly rough with dry skin, the coloring is orange or red, and they are only an inch or less long. The one we found was a gorgeous shade of orange. As adults you can see the red spots remain circled in black, and they become green on top and yellow on the bottom with black spots all around. These spots are warnings of toxic skin secretions so they can coexist with other things in the pond, including fish which normally eat other salamanders. We don't want fish since we created this as a natural woodland pond. Travel - Our son, Benjamin, sent me a link to a very exciting article. I'm a big fan of renewable energy and my favorite country would be Costa Rica which is now running completely on renewable energy. That's right, it's running without having to burn a single fossil fuel. 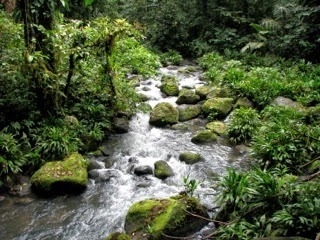 Costa Rica’s hydropower plants alone are generating nearly enough electricity to power the entire country. With a boost from geothermal, solar, and wind energy sources, the country doesn’t need an ounce of coal or petroleum to keep the lights on. Costa Rica is not the only place in the area committed to running on green energy. Bonaire, a Dutch island territory off the coast of Venezuela, operates at nearly 100% renewable energy, and will likely reach that milestone soon with the help of an unlikely energy source: algae. Iceland gets all of its electricity from renewable energy sources, and about 85% of all its energy is produced by geothermal and hydropower sources. Read the entire article. An aura of mystery surrounds the dinosaurs. Where did they come from? Did they evolve? Did they really live millions of years ago? What happened to them? Are there any living today? Has any human being ever seen a live dinosaur? Children and adults alike are absolutely fascinated by these mysterious monsters. 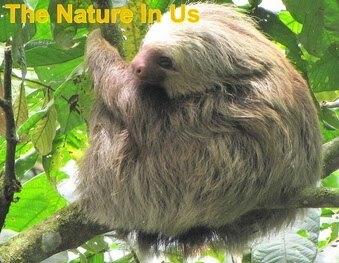 Numerous books and movies have been produced to satisfy a seemingly insatiable hunger for information on these puzzling creatures. The truth of the matter, however, is that there are no real mysteries at all, once you have key information that is not generally known and is withheld from the public. Take a walk through history and uncover some amazing facts that will answer many of your questions about these “terrible lizards.” There's an audio link also so for younger children they could listen and read along. Take a trip back in time to get answers to these questions. Birds - Now that we have Spring upon us I can look back with only memories of some of our winter scenes. 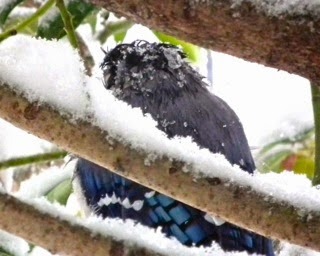 One of them that comes to mind is a frozen-feathered blue jay. On a day of freezing rain and snow coming down together, this blue jay flew into the holly bush at the breakfast window for cover. I have never seen a bird with ice in its feathers. Poor baby. He just sat there looking around. Not long after he took off. Probably to find a blue jay buddy to get the ice out of its feathers. It was a cold day for Virginia. If you click on the enlarged image, be sure to check the photo before this one. It shows him looking at me and the side view looks like a mohawk hairdo. Tidbit - Air Conditioning Without Electricity - There's a way to stay cool without electricity even in desert heat. Wind towers have been used in parts of the Middle East for centuries and now even in the United States. Sometimes modern technology almost feels a little bit behind the times. Check out the 1-minute video. Gardening - Straw Bale Gardening is what it sounds like. Vegetables and flowers are planted into specially prepared bales of straw positioned on top of the ground or even on top of a concrete driveway or patio. The decomposing straw provides a nutrient-rich growing medium that eventually turns into compost. Read the article: Straw Bales Revolutionize Gardening. 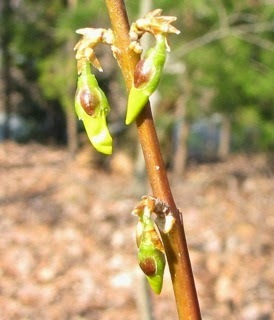 Springtime Buds are coming out all over the yard. It's such an exciting time of year, although the chill of the nighttime temperatures and the slow-warming days haven't provided enough warmth for actually working in the garden, it's fun to see how things look before they become the beautiful color and bloom of Springtime photos. 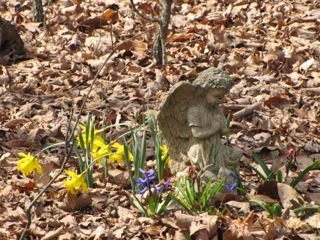 Besides, this week has temperatures are perfect for gardening. 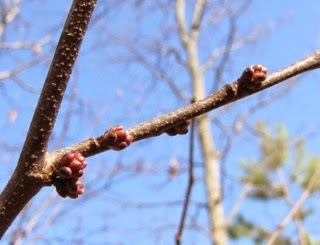 Here's my two favorite photos of buds taken on March 22 here in Central Virginia. The Redbud that we call Mr. Bud has quite the story to tell: Mr. Bud Survives the Crime. We enjoy seeing the forsythias and always marvel that they have anything at all to bloom since the deer sure do keep them trimmed back in winter. I had never taken a photo of them before they bloomed, but we had a very warm day where I could wander about in the garden and I noticed the unusual look of a forsythia bud. The buds on the Anthony Waterer Spirea are barely noticed since there's so much "brushy" parts to the bush (View Enlarged Image). They seem to form a lot of dead twigs and are not easy to keep maintained which requires some thinning out. But when you see them in summer you know that it's worth it. If you cut them back a bit after the first bloom they will produce another bright and beautiful fuschia spot in the garden. View Photos of Brightly Blooming Spireas. Spiritual - Grief and Sorrow - The loss of a pet is such an emotional thing. This is my 8th experience with it. I went to my Secret Place last night and cried in Jesus' arms and then He said to me, "I bore your grief and sorrows. They are dead in the old man ... you can live in the new you by casting your care upon Me, because I care so much for you." We have been applying the crucifixion event - being dead in Christ - for the past two weeks since we started the HeartPhysics New Beginnings modules which is what they are all about - the Death, Burial and Resurrection with Christ. It's about changing the beliefs you hold in your heart to new ones that agree with God's Truth. When a belief changes this way your life changes in many ways as if it was effortless. It requires choosing not to live according to my identity with the past with all old beliefs mostly based from childhood messages about who I was that I wasn't even understanding at the time. "If then you have been raised with Christ [to a new life, thus sharing His resurrection from the dead], aim at and seek the [rich, eternal treasures] that are above, where Christ is, seated at the right hand of God. And set your minds and keep them set on what is above (the higher things), not on the things that are on the earth. For [as far as this world is concerned] you have died, and your [new, real] life is hidden with Christ in God" (Colossians 3:1-3). How awesome what God has given us in Christ. Today I am actually joyful for Squeek because she has a wonderful new body and has so many friends to make and will meet our other 7 cats at our Heavenly Cottage and I know my parents are smiling to have another one of my kitties with them to watch over. Randal buried her yesterday. I picked a spot to the right of Skipper's grave. Next time we go out I'll get some flowers. I want to plant Spring bulbs in the Fall since that's what's on Skipper's grave and it's been nice seeing them come out and be blooming right now as Squeek's body is laid to rest nearby. Doing the practical stuff. Clearing out the kitty drawers of things and making a pile of things to donate to the pet thrift store, a pile for the garbage can, and things we can share with pet-owner friends. May God Multiply Your Peace Every Day! "For the LORD your God is living among you. He is a mighty savior.